The majority of new hydropower projects being constructed in BC are “Run-of-River.” The term “Run-of-River” brings to mind images of small turbines turning in a river to generate low-impact electricity, but the term “river diversion” more accurately describes these projects. Electricity is generated by diverting a large proportion (up to 95%) of a river’s flow into a tunnel or pipeline to power turbines before returning the water to the river further downstream. Turbines are not installed in the river itself. In some cases, an electrical substation. Each project leaves a “diversion reach” —the section of river between the dam and the powerhouse that water has been diverted from. In some cases river diversion hydropower can be less environmentally damaging than traditional hydro projects that require enormous dams and reservoirs, and flood prime valley-bottom habitats. However, some river diversion projects, such as the cluster of 17 individual diversions proposed for Bute Inlet, are massive and would have significant environmental impacts. And some smaller projects (e.g. 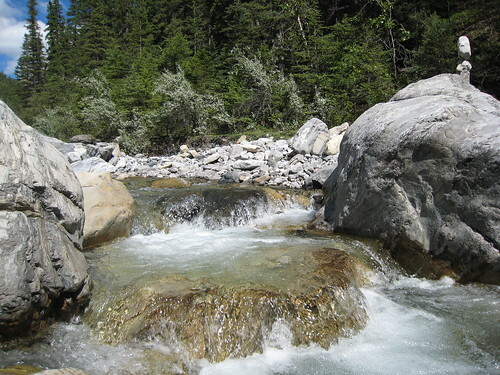 Kokish hydro project) can still have large impacts on fish and wildlife habitat. The impacts of river diversion projects on terrestrial and aquatic habitats can be significant, but when done properly, with care given to footprint size and location these projects can generate electricity that minimizes impacts to the surrounding environment and nearby communities. However, current environmental review and approval processes in BC need major improvements to ensure that inappropriate projects are not approved and that the cumulative impacts of multiple projects do not result in unacceptable harm to rivers and surrounding landscapes. Because river diversion hydro projects do not create large reservoirs, they only produce electricity during periods of high streamflow. Unfortunately, BC’s demand for electricity is highest during the coldest months of winter, when streamflows in BC are lowest. When river diversion hydro projects are not producing power, we must rely on our large dams, and when river diversions are producing power, it becomes necessary to refill the large dams. Therefore, large scale “run-of-river” hydropower development is not feasible without having enough large dams or other sources of “firm” power to buffer the intermittent power production caused by seasonal changes in streamflow.